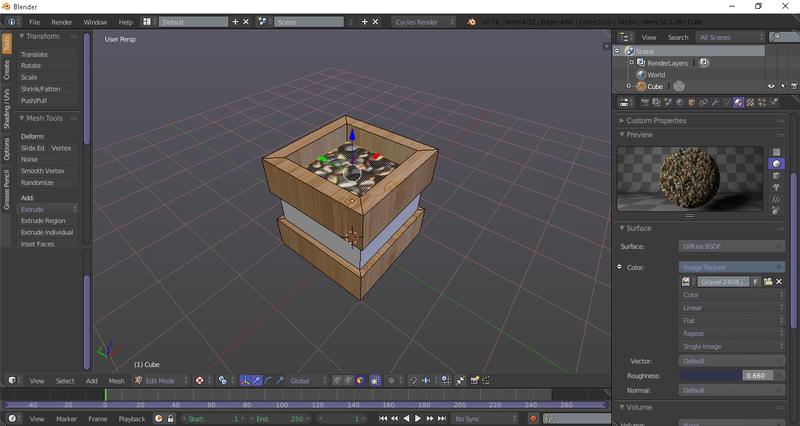 ok so as you can see in the image above, I have made 3 materials using cycles render (the wood, gravel and metal). No nodes. My wood texture came out great. My gravel texture seems super stretched. The actual image I'm using is much more detailed than bender is making it out to be. Any suggestions? I'm a complete beginner. Not the answer you're looking for? Browse other questions tagged cycles texturing materials image or ask your own question. Why is my texture actilng like a color? How can I create spherical topology from a 2D image? How to Deal with Warping Textures in Cycles? Would it be possible to create a wood/metal texture only using nodes, not texture images?